I love history. Not the politics and wars, kings and presidents kind of history, but history about how people actually lived in years past. I'm fascinated by the houses on Summit Avenue in St. Paul, and have visited the James J. Hill House several times. So when I heard about a play being produced in the house I was intrigued. And when I found out that it stars two 2011 Ivey Award winners, there was no question I was going to go see it. After Miss Julie is produced by the Gremlin Theatre, normally located on University Avenue in St. Paul. But there really is no better place to see this show than in a big, beautiful Victorian mansion. When the setting so perfectly matches the content, it lends an air of authenticity to the piece. As I watched the drama unfold, I couldn't help but think that such a scene might really have occurred in that very room a hundred years ago. That's kind of thrilling. I felt like I was eavesdropping on these three people's fascinating and complicated lives. The play is set in a large manor house outside of London in 1945; the action takes place solely in the kitchen, which in the James J. Hill house is in the basement (food was sent upstairs via a dumbwaiter so that the mess and noise of the kitchen was out of sight). 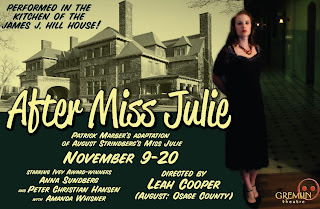 The three characters in the play are Miss Julie (Anna Sundberg), the daughter of "his lordship," John (Peter Christian Hansen), the chauffeur, and Christine (Amanda Whisner), the cook and John's unofficial fiancee. Christine is in the kitchen doing her work (even as the audience enters the room), and John joins her after driving the master of the house to London. Julie follows him down to the kitchen in the hopes he'll dance with her at the party upstairs. He feels obliged, and Christine accepts the way things are even though she's not happy about it. Julie's fiancee has recently broken off their engagement and she's desperate and out of control. When an exhausted Christine falls asleep, Julie flirts shamelessly with John, testing the limits of his patience and his duty. John grew up on the estate and admits that he has always secretly loved her. Christine retires to bed, and John takes Julie to his room, at her request (command?). Their relationship is a constantly changing power struggle; at times they are unbelievably cruel to each other, at times sweet and loving. They toy with the idea of running away to New York together, but I don't think either of them really believes that could happen. Julie's father, John's employer, calls, and John jumps to bring him his coffee and well-polished shoes. Julie and John are trapped in the roles they were born into, and don't know how to get out. There's no happy ending for this couple. This three-person cast is excellent (directed by Leah Cooper, who also did a great job with a much larger cast in August: Osage County at Park Square a few months ago). In the small intimate setting you get a close-up view of the look in their eyes and the expression on their faces. Peter has this intensity that's just about to boil over, and sometimes does; you can see why Julie falls for John (Peter played another violent, angry man in True West a few months ago). I've seen Anna three times in the last several months, and she only gets better. Julie comes off as the spoiled and haughty daughter of a wealthy family, but we see glimpses of a lost little girl underneath. Amanda makes Christine sympathetic; she's the only likeable character - a hard-working woman trying to find a little happiness within the limitations of her life. The actors go in and out of the several doors to the room (what fun to crawl around in the bowels of this magnificent house). On a few occasions they all exit the room; the audience is alone for several long moments in a deliciously awkward silence, during which we are left to imagine what is going on behind closed doors. After the show the audience can stay for an abbreviated tour of the house. It was a wonderfully entertaining evening - intimate, involving, brutally real theater followed by a tour of this grand house. 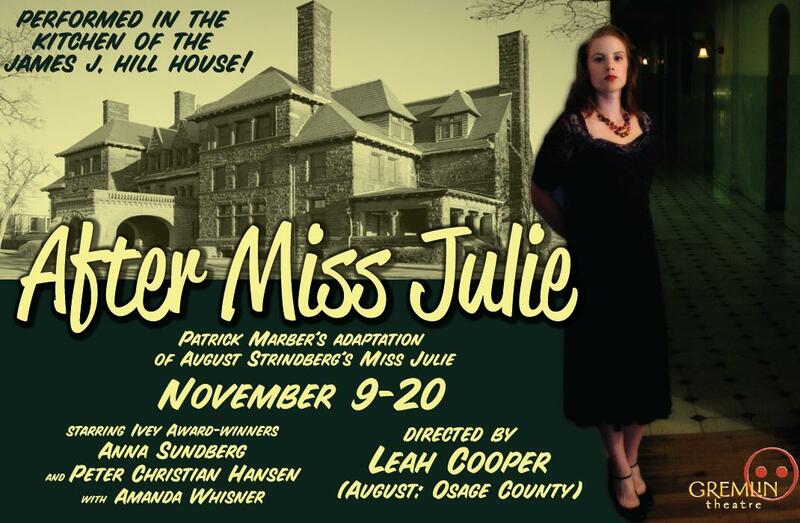 Unfortunately After Miss Julie closes this weekend, but check it out if you can. And if not, go visit the James J. Hill House anyway, and see how the rich people (and perhaps more interesting, their servants) lived a hundred years ago.